Last month, I taught a Novel Revision Retreat at the Rolling Ridge Conference Center in North Andover, MA (see the photo album on Facebook), and I was reminded of the need for your critiquers to read your entire manuscript. Writing a chapter is easy. Really. Critiquing a single chapter tells you little about the story under question. Instead, it tells you something about your writing style, your voice, your choice of individual words and your strengths/weaknesses in crafting a sentence. But that critique tells you little about your storytelling skills. 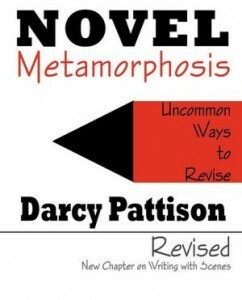 This is the workbook required for Darcy Pattison’s Novel Revision Retreat. In the Novel Revision Retreat, writers are divided into groups of four and within the group, they exchange manuscript. That means you’ll have three others who have read your entire manuscript. That is gold. Now, your feedback will be about the whole story. Plot. Much of the discussion focuses on the overall plot. Writers have an inbuilt idea of story and how a story should progress. Lectures point out additional options, and then writers work on their own plot. Finally, they address both the outer narrative arc and the character arc in their group’s stories, and easily point out the holes in the stories. Feedback from three people, each with a different background, gives feedback about what people think are believable and authentic events. Within the groups, writers raise questions about the sequence of events, motivations of characters, questionable details about the event and more. Character. Writers approach the characters in the novels they have read with hopes of meeting someone real, someone they would like to spend time with. If the characterization is off, they can pinpoint when and where that happens. They will hold the writer’s feet to the fire and make sure the writer goes back and re-imagines the character in a richer and deeper way. Basic Skills Practicing basic skills of using great language, evocative sensory details is also crucial to the whole novel revision. We discuss ways to use sensory details to create mood and tone, and how to use zooms, pans and scans to control the focal length of the narrative. Revision Plan After extensive revision discussions throughout the weekend, each writer goes home with a plan of action for his/her novel. This includes priorities for where to begin the revision, encouragement that some things are working, and sharpened writing skills that provide hope that this revision will be amazing. One great outcome of such a retreat is the sense of community. Often a group forms an email critique group that continues into the future. Because they bonded in person over their novels, it’s easier to keep such a group going for a long time. For information on hosting a retreat in your area, email darcy at darcypattison dot com. To see some of the alumni of the retreat and their books, see here.